EVERETT, MASS. – With the imminent opening of its taproom in Everett, Down The Road Beer Co. is ramping up production. Following the extremely successful Queequeg’s Revenge New England IPA, Down The Road will soon release two, fresh, NEIPAs: Golden City and Dreamtime. Both beers clock in at 7% ABV and 60 IBUs, but they each explore distinctly unique hop profiles. One of two new releases by Down the Road Brewery as they prepare to open their new Everett brewery and taproom. Golden City is a hazy IPA brewed with El Dorado and Bru-1 hops. Named for the mythical shining city of South American legend, the beer is an explosion of tropical fruit with distinct notes of pineapple, melon and stonefruit. The DTR team had a blast with Golden City’s packaging, and many of the brewery’s employees, including owner and brewmaster Donovan Bailey, are featured in the label’s artwork. Dreamtime is hazier still but with a dramatically different flavor profile. Featuring Ella and Vic Secret, the Australian hops offer a delicious melange of herbs, flowers and soft fruit. Dreamtime references the trance-like state Aboriginal shamans employ to explore the hidden truths of the Outback. The label art is an intriguing mashup of primitive, Australian rock painting and western watercolors depicting The Blue Tongue Lizard Man, a legendary shaman who learns the secrets of the universe by speaking with animals. Golden City and Dreamtime are limited production runs that will be available in 16-oz. cans and on draft throughout Massachusetts from mid- to late-August through early fall. Both beers are best enjoyed as fresh as possible to fully appreciate the complexity of the hops. 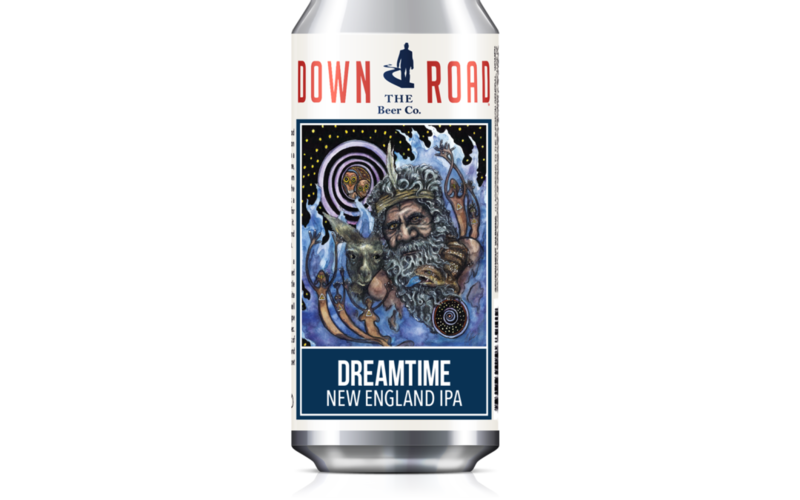 Helmed by veteran brewer Donovan Bailey, Down The Road Beer Co. is one of the fastest-growing breweries in the Greater Boston area, exploding across draft lines and craft coolers from Amesbury to Amherst over the past year. DTR is capping construction of a state-of-the-art brewhouse, which will supply beer for all package distribution, as well as its 300-person Everett taproom, mere blocks away from the Wynn Boston Harbor Casino. Ribbon-cutting is expected in fall 2017, so visit us online or follow the company on Facebook, Twitter and Instagram at @DTRBrewery to find out more.